I have always been enamored with rabbits, in case ya didn’t notice. I’ve harbored my undying love for them since my kindergarten days toting around a stuffed velveteen rabbit by its ear. Since then many rabbits have left their trails of paw prints through my house and heart. From tiny, frisky little bunnies to the laziest, lop-eared love you’ve ever seen. But college was the first time I discovered angora rabbits. They appeared to me like perfect creatures. They need more care (in the form of grooming) than other rabbits but they’re ridiculously fluffy and cute. I mean the grooming is just an excuse to spend more time with them right? So when someone needed to re-home Lynx, Hazel, and Maya we brought them home to the farm. They are so fun and lovable and fluffy. Did I mention ridiculously fluffy? Like somedays it’s hard to find feet, tails, and faces in all that fluff. Angora rabbits can really be great cut in full fluff but this summer we just couldn’t handle it and sheared them. 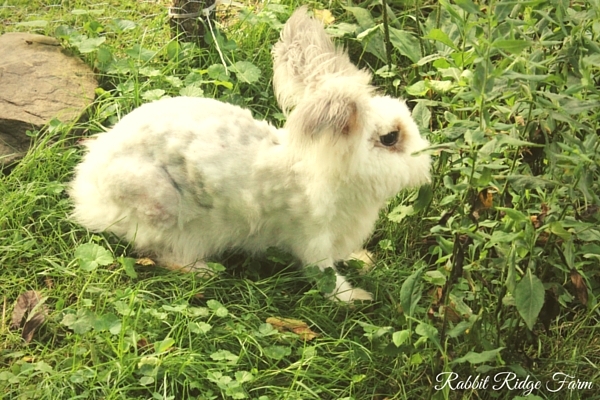 Here’s why you should shear your rabbits for the summer too. As summer temps continue to climb it’s hard to keep anything that’s not in the freezer cool. Seriously though, when I’m in a sports bra and shorts, sitting in a hammock in the shade, and sweating I know it’s hot for all the animals especially when the wooly ones. As cut as they are pre-haircut our bunnies health and happiness is priority number one. Shearing them means short hair they might actually get to feel a breeze through! 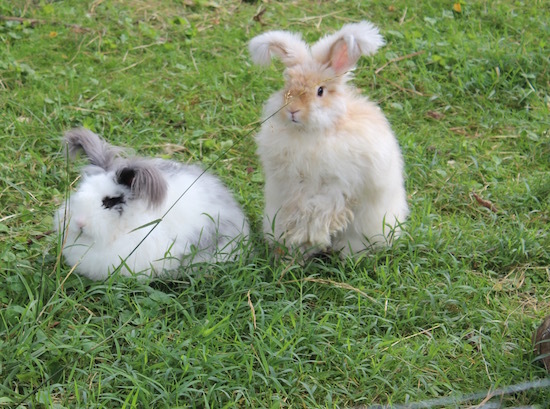 For more tips on keeping rabbits cool check out this post from The Cape Coop. Homesteads get busy in the summer. Really busy. Like I mentioned before angora rabbits are both adorable but there also high maintenance. When there’s corn to plant, tomatoes to can, and so many weeds to pull finding time to give them proper grooming can be a struggle. Sometimes you just gotta cross a few things off your to-do list to stay sane. Fleas and other insects don’t like it. Angora rabbits can play host to all sorts of insects. Fleas, ticks, and mites all love to burrow in amongst the wool. We’ve noticed however that their really not a fan of shorn rabbits where there isn’t a lot of fur to hide in. Spare yourself some headache and your rabbit some itchiness by keeping their hair short during the height of the summer bug season. Even if you totally butcher their new haircut you don’t have to worry. They won’t look wonky for too long. Also if you cut their hair a little too short and are worried about them getting chilled you can easily sweater them for a little while their fur fills out a little. 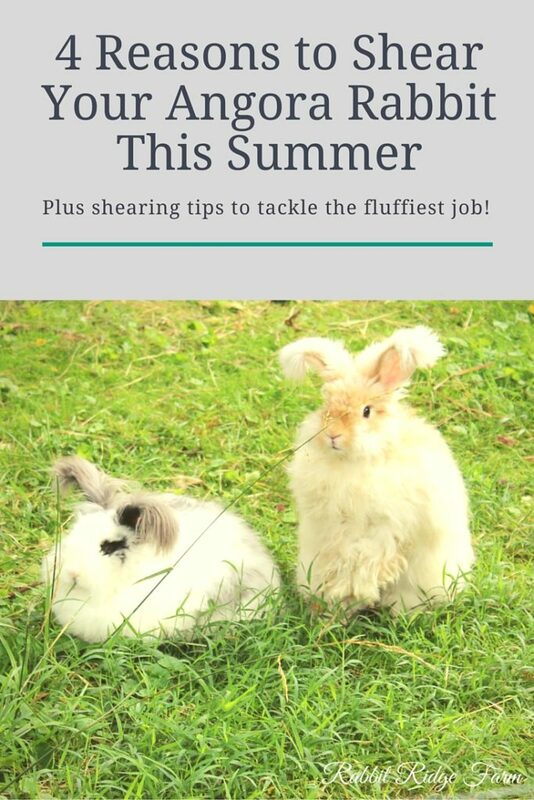 If you decide that shearing is the best option for you and your buns I have a bit of advice to help you tackle the job. You’ll need to invest in a set of clippers (sorry folks beard trimmers literally just won’t cut it). I’ve heard that these German Red Clippers are the absolute best but if you’re anything like me they’re probably a little out of your budget. Recently we purchased this more economical set from Oster with a #40 blade and have done three rabbits so far with success. Say what? No it’s not for the bunny it’s for the clippers. Clipper blades tend to heat up quite a bit and rabbits have extremely thin and sensitive skin. To combat this issue without it taking forever to get the job done I just hold my clipper blades against an ice pack everytime they start feeling to warm. Oil and clean the clipper blades, a lot. Seriously a lot. I brush clean and oil the blades overtime I stop to cool them. I don’t know what it is about angora wool but this step is an absolute must. While I normally groom my rabbits on my lap shearing seems a lot easier on a table. I just use an old tray table I can sit in front of and cover it with a towel (so the rabbit doesn’t slip). The rabbits seem pretty happy to just sit there. While it’s totally doable either way it will be a lot faster to shear you rabbits if they’re wool is free of dirt and hay. Plus it’s less wear and tear on your clippers. While shearing your rabbits is not a total fix to the battle against summer heat waves (it certainly hasn’t cooled me off any) it will make them feel better.